Back in 2014, we adopted a retired seeing eye dog, Tajji, and I began a series of blog posts about our life with her. She departed over the Rainbow Bridge last December at age 12 ½, rather old for a German Shepherd Dog. We now welcome Seichi (or, as she might be called, Seiji Esmeralda McBoing-Boing for her bouncy energy). Her shelter name was Sage, but for various reasons we added on to it, keeping the S and long A. The way she came into our lives was this. 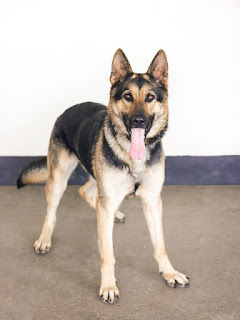 While browsing through the German Shepherd Dog Rescue website, I saw a dog on the private party page that looked really good. Going on the supposition that perhaps the universe was presenting us with our new dog, we called his owner. It turned out (a) someone else was already seriously interested in the dog; (b) he had serious noise phobia issues. Having wrestled with Tajji’s dog reactivity, we had been hoping for a dog that we could take anywhere, but as it turned out, the other person adopted this dog. However, the owner notified us that a friend of hers who worked at an animal shelter said they had a female GSD that sounded lovely. So, although the shelter was 90 minutes away, we drove up to take a look. Sage/Seichi was more than we’d hoped for. Only 4 years old, loving and sweet, bouncy and eager to please. We said yes. They had to keep her another couple of days as she wasn’t spayed yet, but she soon came to her new home. We’re now in the process of letting her settle and then for her and the cats to get a peek at one another through safe barriers. We’ll get a better sense of her previous training, if any, and what motivates her (so far, love trumps food, but that could change as she calms down). Seichi did beautifully on her first neighborhood walk. Although clearly excited, she stayed close to “her people,” glancing back (“checking in”) from time to time, and she didn’t freak out about anything – dogs, tree trimmers with noisy machinery, etc. So begin her adventures – stay tuned for more! Oh, you did decide on a new furry one! She looks like a darling. So hope this works out for all of you!